This morning the girls both attended jazz dance technique class at the Stage Door. They are working on their number for the studio’s recital in June. In the afternoon, S11 attended a birthday party for M14, a friend from co-op. He invited several other friends from co-op, mostly those in the chess club. We got him a chess t-shirt that had a graphic of the pieces with the tag line, “Choose Your Weapon!” It was fun to see the kids interact. The youngest was V10, with a range of ages in between her and M14. Both boys and girls were invited, which was very refreshing. I appreciate that homeschooling allows kids to be friends with a range of ages well before high school (and life) begins. Today we attended our Friday co-op. On second Fridays, we have “funshops” in the morning session, where the kids take turns leading an activity on something that they are interested in. O9 and her friend, V, ran one on Rainbow Loom. We also donated a bin of LEGO for our friend N’s funshop, which went on at the same time. The kids had a ball with the funshops, and several wandered back and forth between both. After lunch, they had open time to either work on writing with Ms Eliza, jam with Z, or just play with some of the other kids. S11 played chess and checkers with a few of the others while O10 did some gymnastics demonstrations and helped a few younger kids work on their cartwheels and roundoffs. This morning we attended the week 1 CoOp session, and then headed to our local Barnes and Noble in the afternoon for a Mini Maker Faire. Truthfully, the maker faire was a bit disappointing. It was really just a product expo for some STEM-related merchandise. The stuff was cool, and it was hands-on, but it felt really sales-pitchy and not very organic. The Maker Faire we attended at the Akron Public Library was a lot more to our liking. But we still had fun trying out some of the products. 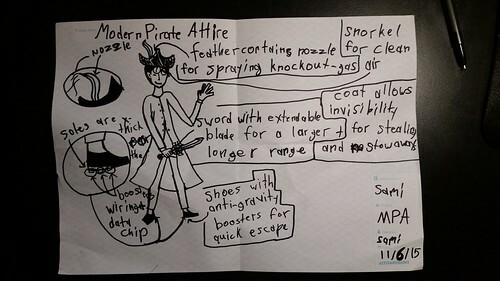 S11 designed some “Modern Pirate Attire”. I love her attention to detail, and emphasis on weaponry. The kids also had a chance to try some mini robots that could follow a line drawn by a special pen, and sewed a pillow with fabric they printed from a computer image.